The newly redesign screen included with both 11- and 12.9-inch iPad Pro models is what Apple refers to as a Liquid Retina display. The "Liquid" designation is applied to Apple's LCD displays that have rounded corners and reduced bezels, pushing screen boundaries nearly to the edge of the device. The iPhone XR was first to adopt Liquid Retina display technology. Also included with the new display is Tap to Wake, an addition that makes sense given Apple deleted the Touch ID home button in favor of Face ID. A simple tap anywhere on the display will bring it to life to see the time, battery, notifications or widgets. Aside from the beautiful display, Apple also redesigned the exterior, combining the flat back design from the past several years with the squared off edges of the original iPad. Smaller body on the 12.9"
That new redesign has a few important benefits. On the 12.9-inch iPad, Apple reduced the overall volume by 25-percent for a lighter, thinner, smaller device that is easier to handle. The 11-inch iPad Pro keeps the same size as the 10.5-inch model but increases the display size to now be a half-inch larger on the diagonal. This adds some much-appreciated real estate to the smaller iPad Pro. Long-gone is the home button and Touch ID. This allows the new bezels to be significantly smaller and the tablet more intuitive. It is much easier while working on a keyboard to keep your hands where they are and rely on Face ID to enter your credentials, authenticate a purchase or unlock your tablet. Face ID relies on a complex array of cameras, sensors and a dot projector built into what Apple refers to as the TrueDepth camera system. That also unlocks other features, such as Portrait Mode selfies. Each photo can have different Portrait Lighting effects applied, as well as have the amount of background bokeh adjusted. While the front-facing shooter was upgraded to the TrueDepth camera system, the rear camera got an upgrade of its own. Similar to the iPhone XR, it appears the iPad Pro has deeper pixels for better quality images. We noticed an immediate difference between the last generation iPad and the new model. The lens also has switched from a 6-element lens to a 5-element design, and you can now shoot 4K video at 60 frames per second. Smart HDR is the latest improvement to Apple's High Dynamic Range photo mode. Smart HDR is enabled automatically when necessary and should be a marked improvement from the previous HDR. Apple has married the new image signal processor with the Neural Engine to better capture tricky photos. First, the camera is constantly shooting a four-frame buffer so there is effectively zero lag when the shutter is pressed. It then adds interframes between those frames at higher, lower and longer exposures to capture more detail. It then combines certain parts of each photo together to create the best possible image. Lightning has been swapped out for USB-C on the iPad Pro, making it even easier to connect modern peripherals. Keyboards, cameras, MIDI devices, displays and more can connect directly via USB-C. Instead of the 12W charger included prior, this year's iPad Pros are equipped with a speedy 18W USB-C wall adapter for even faster charging out of the box. Thanks to the new USB-C output, your iPad can now connect to 4K monitors. Either using an adapter or USB-C, you can use an external monitor to enhance your workflow. Apps can display different content on that external monitor, like editing previews in iMovie. Once more, thanks to that USB-C port, devices can leach power from your iPad. Plug your iPhone or Apple Watch right into the USB-C port to power up on the go. As usual, Apple maxed out the processor on the new iPad Pros. With the new 7-nanometer A12X Bionic processor, they are blazing fast, pulling in some crazy Geekbench 4 scores. On our 12.9-inch model, we garnered scores of 5,074 and 16,809 on our single and multi-core tests, respectively. 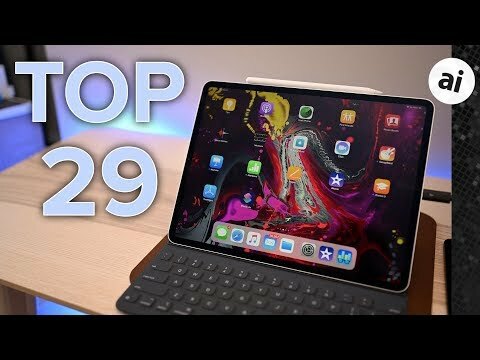 That outpaces many computers (92-percent of portable computers sold in the last 12 months, according to Apple). Graphics increased two-fold as well thanks to the new 7-core GPU, which is great for new applications coming such as Pixelmator Photo, Autocad and Photoshop CC. Instead of being located on the longer, horizontal side, the Smart Connector has now been relocated to the bottom, short side. This should allow for more accessories to take advantage of it. Apple Pencil 2 got a massive makeover with a matte finish, double-tap gesture support for swapping tools, wireless charging on the new iPad, and magnetic connections to not get lost. Because of all the new improvements, the new Apple Pencil only works on the latest iPad Pros. Embedded within the back of the new iPad Pros are a series of magnets. In the future, third-party manufacturers can take advantage of them for affixing protection and accessories, but out of the gate it is being used by Apple's new Smart Keyboard Folio. Embedded within the A12X is Apple's M12 motion coprocessor. This helps deal with the accelerometer, gyroscope, barometer, Siri voice commands and more. It retrieves and stores this information even when the iPad is not in use which can significantly save on battery life. Using the True Depth camera system, both Memoji and Animoji come to iPad for the first time. Available in messages, these fun characters mimic your facial motions by measuring several muscles in your face and your tongue and eyelids. Just like with many of Apple's other recent releases, the latest iPad Pros have Bluetooth 5. Bluetooth 5 adds additional bandwidth and speed which will have noticeable effects on new accessories that utilize the standard. It also now supports simultaneous dual-band 2.4GHz and 5GHz Wi-Fi. This usually means that a device supports connections on both radios at the same time, which Apple could use to connect to a Wi-Fi router with both radios to combine bandwidth. Another possibility is the capability to connect to both radios at a router and switch between them as one signal becomes weak, rather than holding onto it at the edge of reception. Just as we saw with the iPhone XS and XS Max, cellular iPads have added support for Gigabit-class LTE. This is carrier and location dependent, but in areas where supported, cellular speeds will be much improved. As have been seen during Apple's event and in the latest advertising spots, Apple included eight new exclusive wallpapers. Apple has really been upping their audio game the last couple of years. Outwardly, Apple still has four speakers on the iPad Pros but they've been completely redesigned. They now use tweeter-woofer pairs for better wide stereo output. All previous iPads capped their storage capacity at 512GB, this year, Apple has included configurations up to 1TB. If you do pick up a 1TB iPad Pro -- in either 11- or 12.9-inch sizes -- they will come with 6GB of RAM rather than 4GB. The new Pros now sport five different microphones, rather than just two. Three are the top edge, one on the left side, and one adjacent to the camera bump. Apple sometimes uses iPad as a testbed for cutting-edge wireless protocols, introducing its proprietary Apple SIM card alongside iPad Air 2 before the technology was embedded in the first-generation iPad Pro. For 2018, Apple is moving its embedded solution to eSIM for wider carrier support, though Apple SIM is still supported as a physical card. Last year iPhone gained support for QZSS and Galileo satellite systems. This year, iPad is including support too for both Galileo (Europe's Global Satellite Navigation System) and QZSS (Japan's regional Quasi-Zenith Satellite System). Does the USB-C support video in-put? I’d like to use the new iPad as a wired filed monitor for my DSLR. Does your DSLR have an app to go along with it? Mine does, and though I haven't fully investigated it, I can allegedly remotely take pictures with it. That sort of implies that I can view what the camera sees from within the app. Wondering when iOS Files will gain access to the USB port and mouse/trackpad support. If you add those and a hinged solid keyboard, and these iPads are the next generation MacBooks. My $0.02, as ever. iOS 13 could reveal some interesting options for the iPad Pro’s USB-C. I hope iOS 13 will bring support to iPad Pro as a "wacom" tablet for desktop Macs - that will suddenly make it appealing for photographers, designers, and artists. Is there already a cable that goes from USB-C to Lightning? How can one power the iPhone using the iPad, or the Apple Watch, for that matter? Do I need a USB-A to USB-C converter at the end? in previous articke you wrote: Over 200 million users involved in beta testing macOS Mojave, iOS 12, tvOS 12, and watchOS 5. There is https://itunes.apple.com/us/app/eos-remote/id565839396?mt=8 but works over wifi so require Canon camera with wifi. Or https://en.softonic.com/solutions/what-are-the-best-dslr-controller-apps-for-iphone-or-ipad but again wifi cameras.